It was one of those days… no real plans for lunch or dinner, no motivation to go to the store, no solid leftovers in the fridge. After a quick assessment of the veggie drawer and the cabinet, I landed on the old standby: noodle bowl. I love this dish because it can be made with whatever you have in the veggie drawer as long as you have fish sauce, oyster sauce, soy sauce and sriracha on hand. 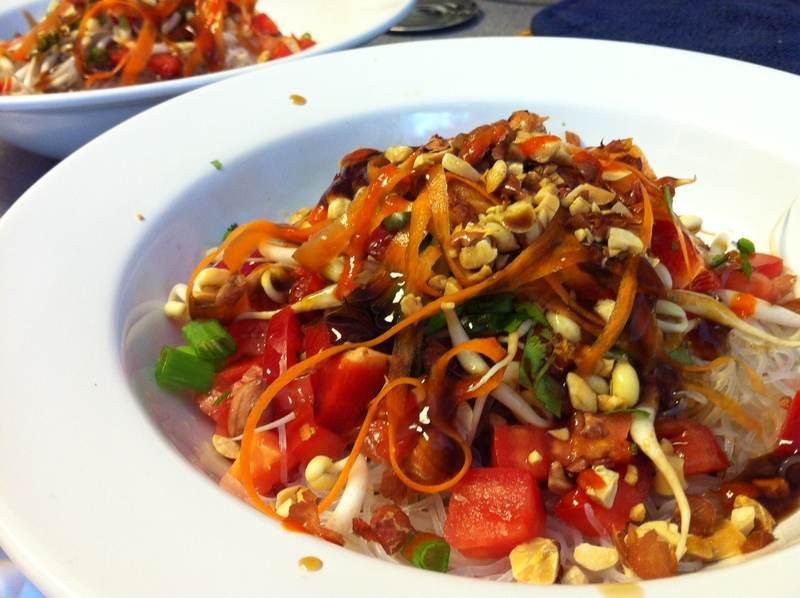 Layer ingredients in a large bowl: cabbage, noodles, tomato, red pepper, bean sprouts, green onion, carrot, peanuts and cilantro. Add a generous amount of fish sauce and drizzle with oyster sauce, soy sauce and Sriracha.